← The Princeton-by-the-Sea… In My Mind…. I’ve got a new Quest. No, I haven’t given up on reaching “Acid Beach,” the reputed Merry Prankster’s Ultimate Beach Party place. But, now after two attempts to reach it, I realize it is inaccessible by dry land even during the lowest of tides and that the alleged spot to rappel down a crumbly cliff of sharp rocks looks more like the access to the Emergency Room then to a picturesque beach and the stunning, nearby Warm Water Lagoon with its giant arch. So while I wait for my lateral epicondylitis (sounds more excusey then Tennis Elbow, doesn’t it?) to heal, so I can kayak along the isolated, rocky, wave battered coast a couple of miles to reach it, I’ve switched goals. After all, the only place I’d ever seen it mentioned is as a caption below pictures on the California Coastal Records Project website. And even that’s squirrelly, as Picture #6419 in 2002 has it in a different spot then Picture #200506751 in 2005. Was I just being led on a snipe hunt by somebody’s pipe dream of the non-metaphorical type? It didn’t help my confidence that Picture #6418, captioned “The Notch,” Picture #6420, captioned Warm Water Lagoon, Picture #6421, captioned Amb’s Beach and Picture # 6429, captioned Trefiret Beach all were previously unknown to me and apparently everyone else, as I found when I tried websearching them. No such places. No such names. It recounted a wild story about the origin of the Merry Prankster’s name as related by George Walker, one of their members. I’ll let you check out the site, but basically he relates that on the day the Alaskan Good Friday Quake hit (March 27, 1964) they heard a tsunami was generated and coming towards California. 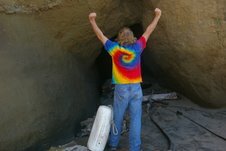 Like any good leader of a thrill-seeking group, Ken Kesey, led the band out to San Gregorio Beach to a cave that had been used as an observation post during World War II to watch for the thought to be imminent attack on our coast by the Japanese. While in the cave, probably “tripping”, the sea began to recede for hundreds of feet only to soon return with a vengeance, trapping them, flashlightless and bewildered. At some point, Ken Babbs, or Cap’n Skypilot, as he is known, yelled, “Have no fear, The Intrepid Traveler and his Band of Merry Pranksters will find a way to get us out of here.” The rest is psychedelic history. 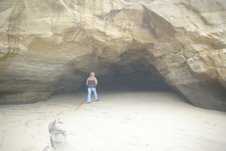 Being familiar with the caves of San Gregorio, I decided I’d go out there, get some photographs of them and write a story about the origin of the Prankster’s name, apparently a little known bit of trivia. 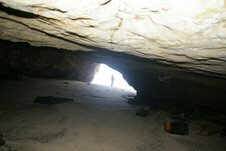 I’ve attached some photos of the two caves. Living in San Diego in 1964 and remembering the tsunami warning on TV, but not much else I did some research before writing the story. Oh. Oh. The tsunami, that came in four major waves and destroyed a good chunk of Crescent City, while killing 11 people, was still 7 to 10 feet high when it reached Half Moon Bay early in the morning on the 28th. If the Pranksters had been in either of the caves I knew of, the Psychedelic Revolution would have floated out to sea with most of its most famous founding members. High tide with high surf can fill that cave, let alone a tsunami of that size. Was I being pranked again? An imaginary event to go along with the imaginary names? After reading this I’m thinking, stuck in character and keeping the prank alive. Oh well. I sent him an email that simply said: I agree. Some times facts just reduce the power of myths and legends. Thank you. 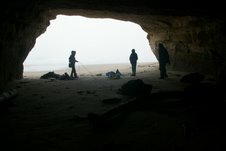 “Ken Babbs forwarded your email re: San Gregorio Beach to me; I found it interesting. 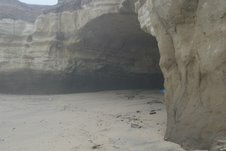 “It’s been a long time, but I believe the “cave” (actually a man-made tunnel) in question is overlooking a beach south of San Gregorio Beach, with a different name. Pomponio is the name that creeps out of my fog-shrouded memory. Just a technicality, I know, but why shun accuracy? “It has been decades since I, or anyone I know of, has visited the site. The cave, a World War II lookout post, where our brave troops scanned the ocean looking for “Jap” invaders, should be visible from the beach below. “You state in your email to Babbs that you want to copy the paragraph from my piece (in Spit in the Ocean VII; All About Kesey) that refers to the cave, and the coining of the name “Merry Pranksters”. You have my permission to copy it, provided you give me credit. “I am working, occasionally and sporadically, on a book-length version of my memories of our travels on “Further / Furthur” (the Bus). If I live long enough to finish it, I hope to see publication. Time permitting, I will look up your work on the indicated website. This entry was posted in John Vonderlin, The Quest. Bookmark the permalink.